The nearest train station is Reutlingen Hbf. Reutlingen is very well reachable from Stuttgart which is connected to the German ICE network. At the bus station Reutlingen (5 minutes to walk from the railway station) take the bus no. 7606 and exit at 'Honau'. Take a cab or walk around 20 minutes. Use the motorway A8 and exit at 'Wendlingen'. Follow the signposts to Reutlingen. From here follow the signposts to 'Schloss Lichtenstein'. The parking grounds are approximately 150 meters away from the castle. At the bus station Reutlingen take the bus no. 7606 and exit at 'Honau'. From here take a cab or walk approximately 20 minutes. At Stuttgart airport take the bus X3 to 'Südbahnhof Reutlingen'. Here take the bus no. 7606 and exit at 'Honau'. Then take a cab or walk 20 minutes. It looks a bit like Cinderella's Castle in the Disney Theme parks: Lichtenstein Castle in the southwest of Germany. Not for nothing it's called the "Fairy Tale Castle". Lichtenstein castle (Schloss Lichtenstein) was built even in the 19th century (between 1840 and 1842) in the historic style (also known as "Neo-Gothic Style"). It is located in a height of 817 meters above sea level, 250 meters above the Echaz valley, a small creek which arises here and flows to the Neckar river. In a distance of approximately 500 meters the ruins of the medieval castle "Old Lichtenstein" can be found. The construction of the castle was inspired by Wilhelm Hauff's novel 'Lichtenstein', which was published in 1826 and which refers to the medieval castle (which is called 'Old Lichtenstein' nowadays). • A "Basic tour" which shows the 1st and 2nd floor of the castle, and lasts about 30 minutes. Particularly armory and coats of arms, furthermore a little chapel with beautiful glass paintings. • A "Special tour" which shows the 3rd and 4th floor of the castle with the Count's private bedchambers. The tour lasts 1 hour. There is a 2nd "Special tour" which combines both the Basic and the 1st Special tour, and which lasts 2 hours. • A "Costumed tour". This is a very special tour as the visitors are dressing up with clothes from the 19th century and are meeting the Duchess Florestine of Urach, who was the 2nd wife of the founder of Lichtenstein Castle. There are several replicas of Lichtenstein Castle, for instance in Lützow on Rügen island or in Osthofen near Worms. However even in South Africa, near Cape Town a copy of Lichtenstein Castle can be found. The castle is closed completely during December and January, and is closed during the weekdays (Monday–Friday) between November and March. In the winter (November, February and March) it's opened during the weekends only (Saturday, Sunday and Holidays) between 10 am and 4 pm. Between April and October it's opened daily between 9 am and 5.30 pm (status: 2014). A visit to the Lichtenstein Castle is an experience for young and old. Feel like Cinderella and enjoy the stay! Lichtenstein Castle was a filming location of the fairy tale movie 'Dornröschen' (Sleeping Beauty). In the film adaptation of the famous tale of the Brothers Grimm, Lichtenstein was the enchanted castle, overgrown by a hedge of thorns. The movie was produced in 2009 by the German Television (ARD) and was broadcasted at Christmas 2009 the first time. In the vicinity of Lichtenstein Castle one finds the 'Abenteuerpark Schloss Lichtenstein' (Adventure Park Lichtenstein Castle). This is a climbing park for kids and adults aged 8 or older. There's an exercise parcour which everyone has to get through prior to get the permission to use the "real" parcours. There are different levels of difficulty with heights up to 16 meters above the bottom. The 'Höhlenwelten Sonnenbühl' (Caves World Sonnenbühl) shows the most visited cave of the Swabian Alb: the 'Bärenhöhle' (bear's cave). Even though it's usually called "bear's cave", actually, there are two caves. Besides the bear's cave it's the 'Karlshöhle' (Carl's cave) which is sticked to the bear's cave. The length is around 250 meters. Additonally the 'Nebelhöhle' (Fog Cave) belongs to the Caves World Sonnenbühl. All caves are flowstone caves. The Swabian Alb is a pretty region offering relaxation and diverse leisure opportunities, as well as a beautiful landscape to explore either by foot or bike. WiFi is available in all rooms. 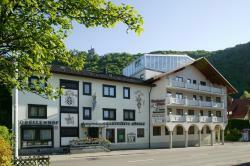 This 4-star hotel enjoys a quiet location near the village of Sonnenbühl, south of Reutlingen. It offers modern rooms, a Michelin-star restaurant, a historic 19th-century lounge, and free parking.